Do you want to start a new website and build your online presence? Whether you want to start a blog or an ecommerce site, choosing the right web hosting provider is essential. There are many web hosting providers for WordPress but not all of them are affordable. If you’re tight on budget, Hostinger is the best web hosting provider for you. No hosting provider can even come close to the affordable pricing plans of Hostinger. On top of that, Hostinger is also regarded as the faster web hosting provider. Starting your website on Hostinger is pretty quick. Hostinger is easy to use and you can install WordPress in a few steps. In this guide, I will show you how to sign up and install WordPress on Hostinger. This guide will show you step by step, how to sign up and create a WordPress site. 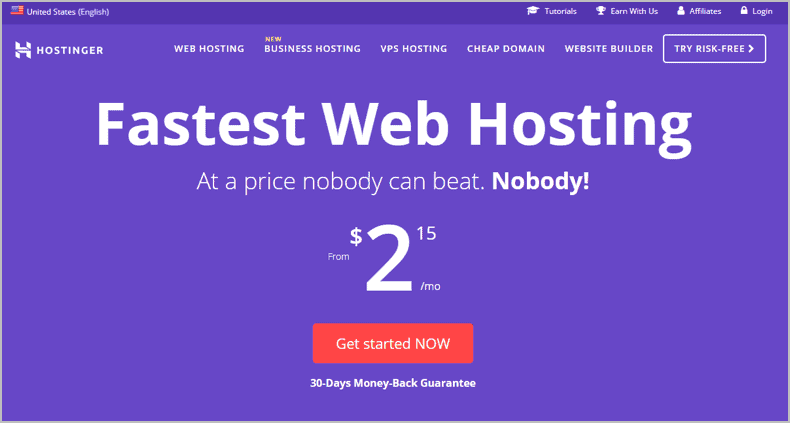 I’ll also cover about Hostinger and discuss about why this web hosting is probably the best choice when you’re on a tight budget. Follow the steps given below to sign up and install WordPress on Hostinger. Once you’re on the Hostinger website, you’ll see the pricing of their most basic plan. This plan costs $2.15/month which is very affordable. You can also scroll down and check out their other plans and choose your preferred plan based on your needs but you can choose a plan later too. For now, click on the “Get Started Now” button on the top. As I said above, you’ll get a choice to select your preferred plan. Hostinger offers three plans each providing different features. This is their most basic plan and is the cheapest hosting you can found anywhere. With this plan, you can set up 1 website with 10GB disk space. The plan is very basic and offers 100GB bandwidth, 1 SQL database, and 1 FTP user. You also get 1 email account and a user-friendly file manager. If you want to start a website that doesn’t have any huge requirements, this plan is perfect for you. The Premium Shared Hosting Plan is Hostinger’s top selling plan and offers everything again at an affordable price. For just $3.49, you can create unlimited websites. With that, you also get unlimited SSD storage space, bandwidth, SQL databases, email accounts, 2X Speed, and FTP users. 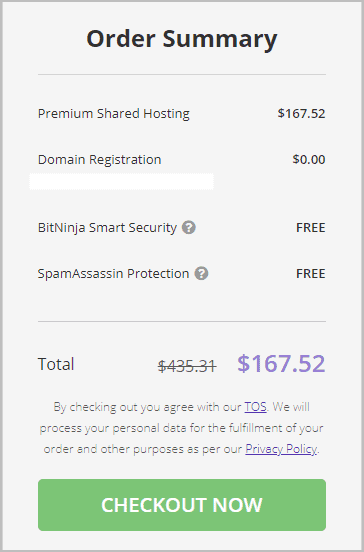 Lastly, you also get a free domain name with this plan. This plan is for you if you want to create a WordPress site that you want to scale fast and has huge requirements. This plan is for websites with large-scale requirements and growing resources. Apart from the features in the Premium Shared Hosting plan, you also get features such as dedicated resources, speed boost, cache manager, isolated resources, uptime monitoring, 1-click installer, and daily backups. You also get 24/7 support and free SSL certificate which is very important for SEO in 2018 and beyond. Choose your desired plan and proceed ahead. Once you choose your plan, you will be redirected to the checkout page. Before you checkout, make sure to check the time period for which you’re paying. By default, it’s selected at 48 months. If you choose to pay for 48 months, you’ll save 46% on your hosting plan. 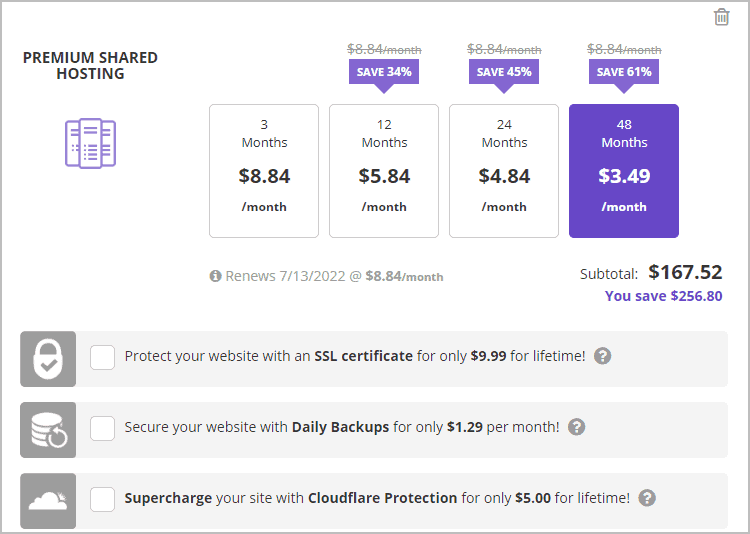 Note: The pricing plans shown on the homepage of Hostinger are when you purchase their hosting for 48 months. Pricing changes if you pay for less than 48 months. For now, I have selected to pay for 3 months. Based on the plan you selected, you’ll be eligible for a free domain. 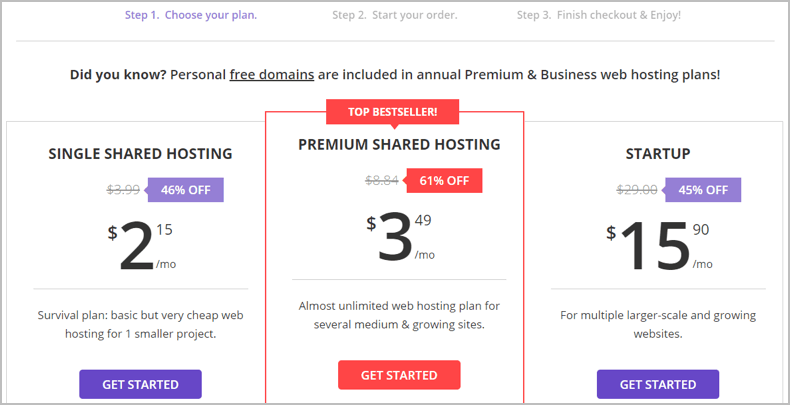 You get a free domain with the Premium and Startup plan. Choose your desired domain name and add to cart. Lastly, check your order summary and once you’re ready, click on the checkout button. Now, you’ll be asked to choose a payment method. 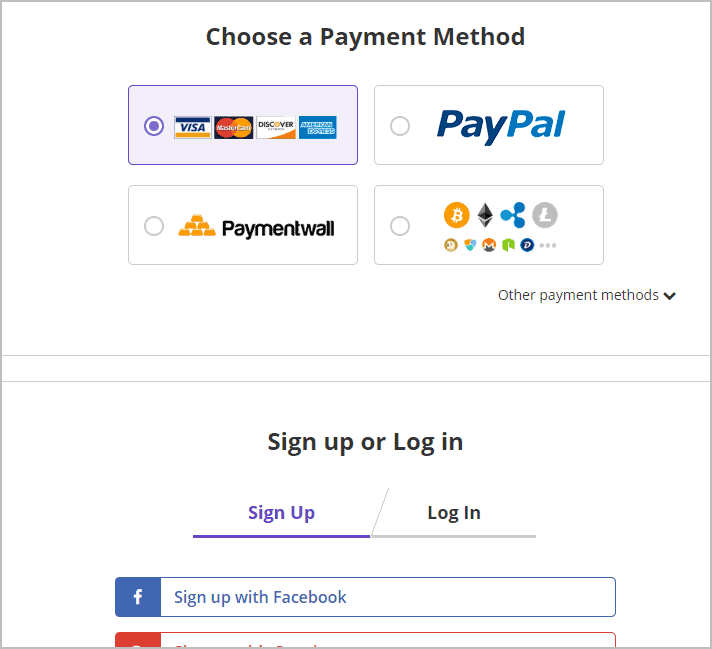 Choose your desired payment and create your account. After successfully purchasing your hosting with Hostinger, you’re just a few clicks away from installing WordPress and creating your website. Go to the hosting menu in your Hostinger control panel. Here, you’ll see the web hosting accounts you have purchased. Click on the “Manage” button to go to your web hosting settings. This is the control panel of your web hosting. Here, you can view and change settings of your web hosting. On the left sidebar, you can view the stats about your hosting account such as the disk usage, bandwidth use, email accounts, subdomains, and more. There are many settings and tools available to help you manage your hosting. You can create subdomains, email accounts, databases, and more. But we want to install WordPress. And to do that, scroll down to the website section in your control panel. Here, click on the autoinstaller. 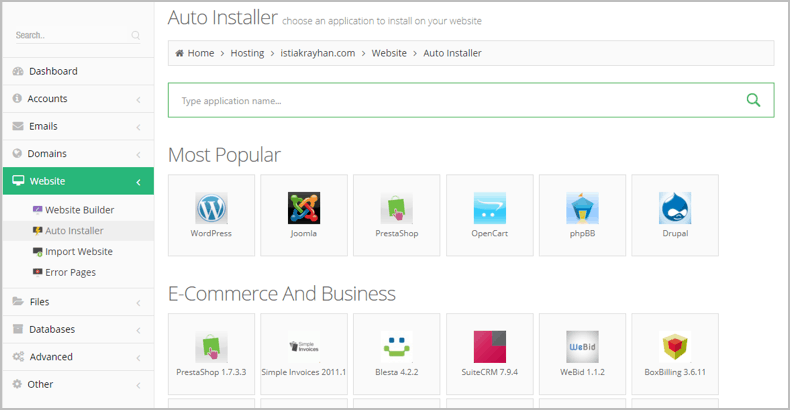 With Auto Installer, you can install many different applications on your website. To install WordPress, simply search on the box. But it’s already visible in the ‘Most Popular’ section of the autoinstaller. Click on WordPress and choose the destination where WordPress should be installed. 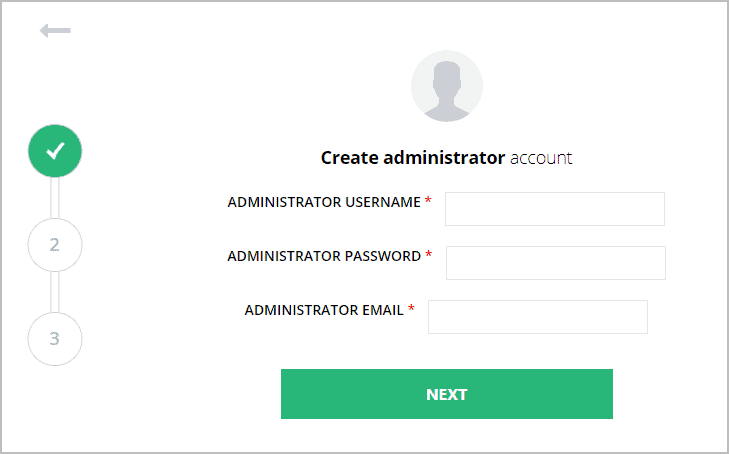 The next step is to create a username and password for your WordPress administrator account. You’ll also have to specify an email address for the account. The last step is to give your website a title and a tagline. And you’re done! You have successfully installed WordPress on Hostinger! Now, you can go ahead and start building you website. 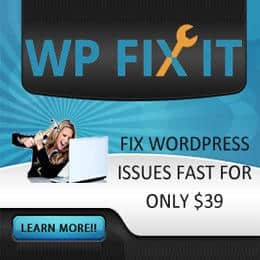 After WordPress is installed on your website, you can begin choosing a theme and installing plugins. If you’re totally new to WordPress, start exploring the WordPress dashboard to learn about how WordPress works. 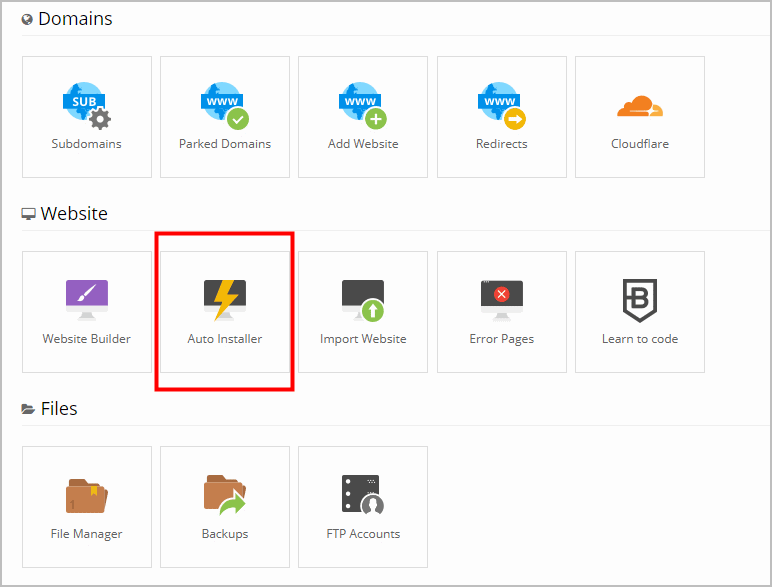 So installing WordPress on Hostinger is that easy! It will literally take you a few minutes to get a website up and running. But your work doesn’t end right after installing WordPress. Don’t forget to explore your Hostinger control panel. You can create an email account for your website. You can also access your file manager and manually upload files to your website. The Hostinger control panel has many applications for various purposes and you should get to know them to have an understanding of the control panel. This will help you manage your website easily without running into problems. If you have any questions about installing WordPress on Hostinger or in general, questions about Hostinger, feel free to comment below. Convert Pro Review: Is It Best Alternative To Thrive Leads & OptinMonster? We prefer WordPress.org. Let me know if you need any help on setting up a WordPress.org blog. Informative post. I would also recommend making some more guides on how to install other cms with hostinger or any other tips and tricks would be useful! I am currently trying their hosting, so it would be helpful. Thanks for the suggestion. But this blog (WPLeaders.com) is mainly focused on WordPress related topics. You have provided a great guide on installing and sign up WordPress at Hostinger web hosting. This post will be very helpful for those who have purchased hostinger web host and having difficulty in installing WordPress. The step by step guide from your side to sign up and install WordPress on hostinger is easy to know. You have well explained the whole post.